Employment in Williston, ND and Grand Forks, ND. Employment in Grand Forks over the last 17 years is remarkably stable and it seemed much the same in Williston in this time too, until around 2010. At that point employment takes off on a stellar climb to the point that Williston is now only 3,000 fewer employed than Grand Forks. Why is this a big deal? The adjustment process within Williston is intense, to the point of seeming like chaos at times. What underlies that is a series of repeated shocks to the economic system such that adjustment to the previous shock is not complete when the next one comes along. 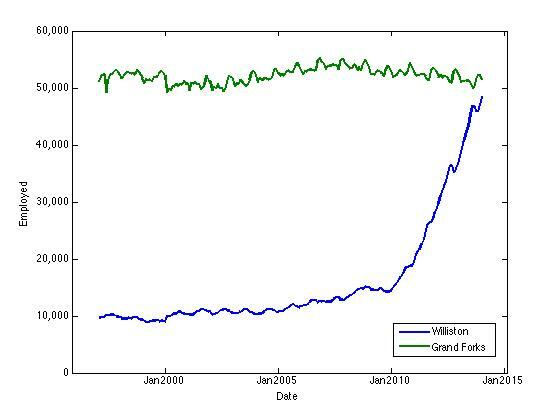 While the employment level did not decline in Grand Forks while it is increased in Williston there can be structural changes to employment that create changes (to be discussed in a later post). While I was in Philadelphia for the American Economic Association meetings I talked to a number of people about the situation in western North Dakota. The astounding monthly growth rate of labor force in Williston (at that time around 2% per month) amazed people. The rest of the state should likely start considering the economic changes in Williston and the west overall as a constraint on their economies, draining labor and other resources to higher profit activities there. In addition, there are likely new opportunities as communities like Williston are unable to keep up with their changed internal dynamics, and will look to outside communities to fill the gap.